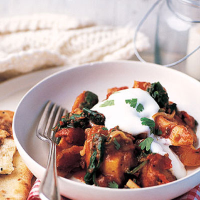 This vegetarian curry should appeal to all the family. It's also really quick and easy to make. Warm the oil in a shallow frying pan over a low heat. Cook the onion, until softened. Stir in parsnips and squash, cutting any large pieces in half once they have thawed in the pan. Fry for about 5 minutes. Stir in the curry paste and tomatoes, cover with a lid and allow to simmer for about 15 minutes until the vegetables are cooked through. Remove from the heat and stir in the spinach. Cover for 1-2 minutes or until the spinach has wilted. Top with a spoonful of natural yogurt and a few coriander leaves, then serve with warm naan bread.